Hanoi (VNA) – Destructive human activities have put coral reefs, sea grass beds and many other marine species off Ly Son Island at risk in recent years, with local authorities urged to make more efforts to preserve the unique ecosystem. Ly Son Marine Reserve in central Quang Ngai province, covering Ly Son Island and its surrounding areas, has a water surface of more than 7,100 hectares, including the 620-hectare no-take zone, an area of more than 2,000 hectares for ecology restoration and another for development stretching across 4,470 hectares. The sea protected area is known for high biodiversity and an ecosystem that houses many rare marine species like black coral, maxima clams and abalone. But these creatures are in danger of extinction due to the activities of local people. Fishermen have used explosives to kill many fish, seriously harming coral reefs. Meanwhile, hundreds of locals harvest natural brown seaweed, which offers shelter for many sea creatures, every May and June. They can harvest an average of 3-5 tonnes of brown seaweed daily, making it difficult to recover. In addition, more than 150,000 sq.m of sand from beaches is exploited each year to cultivate garlic, causing coastal erosion and depleting sea grass beds. 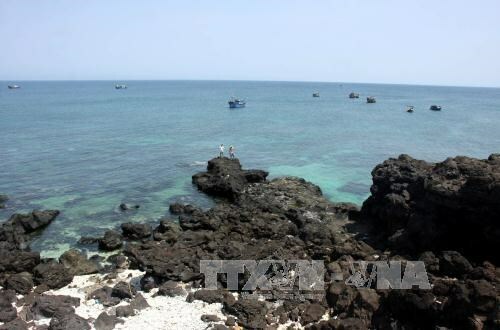 To solve the problems, the provincial People’s Committee adopted a project to use advanced technology to restore coral reefs near Ly Son Island in 2015. Experts have been sent to survey the coral reefs and raise local awareness of the importance of animal and environmental protection. Local authorities and residents have also been provided with training on how to recover coral reefs. A model for coral recovery piloted across 2 hectares of the marine reserve has developed well, giving hope of bringing back endangered species and increasing local seafood yields. The province urged Ly Son Island to intensify management of the sea protected area by requesting tour operators strictly comply with the reserve’s regulations and keeping close watch on the density and development of rare sea species.